Great Tribulation occurs 3 times in the King James Version. Lord Jesus mentions these words one time in Matthew 24:31 and these words occur one time in Revelation 2:22 and – 7:14 without the article THE. Tribulation 22 times, tribulations 4 times. That small word THE of three letters does make a big difference. Furthermore: (great) tribulation is not the wrath of God. Before God will pour His wrath upon this world the Rapture already has taken place. For God hath not appointed us to wrath but to obtain salvation by our Lord Jesus Christ. There is no where in the Bible that anyone IN Christ will not suffer tribulation. On the contrary. Ever since Biblical times until this very day. The prophets, the apostles, Stephen, the apostle Paul, the early Christians, reformers and common folk, who were in possession of an English Bible were persecuted. Nowadays and in many countries throughout the world true Bible believing Christians are being mocked, abused and murdered all because of their faith in Christ Jesus. The very own Words of Jesus Christ can by no means swept under the rug. These things I have spoken unto you, that in Me ye may have peace. 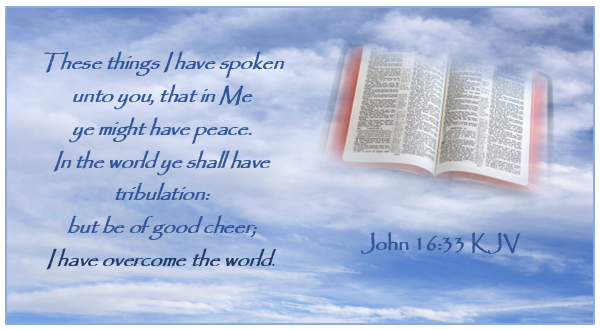 In the world ye shall have tribulation; but be of good cheer; I have overcome the world. After chapter four in Revelation the Church is not mentioned anymore. Is that of any importance? Does it really prove anything? What is described in the first two verses does not relate to the Rapture nor does the remainder of this fourth chapter. Where are the clouds? Where is the sound of the last trumpet? Is John meeting Lord Jesus in the air? No, John is asked “to come up hither” where the throne is, God is sitting on that throne and 24 elders are present. And round about the throne were four and twenty seats; and upon the seats I saw four and twenty elders sitting, clothed in white raiment; and they had on their heads crowns of gold. And the voice of the trumpet sounded long, and waxed louder and louder, Moses spake, and God answered him by a voice. The Day that the Caught Up Together will take place that is the Day of Redemption for all IN Christ. The born again Christians are sealed until the Day of Redemption and will be unsealed when the Book is unsealed, we will be unsealed. At this time God will restore the breach between Him and Israel. And grieve not the Holy Spirit of God, where ye are sealed unto the Day of Redemption.